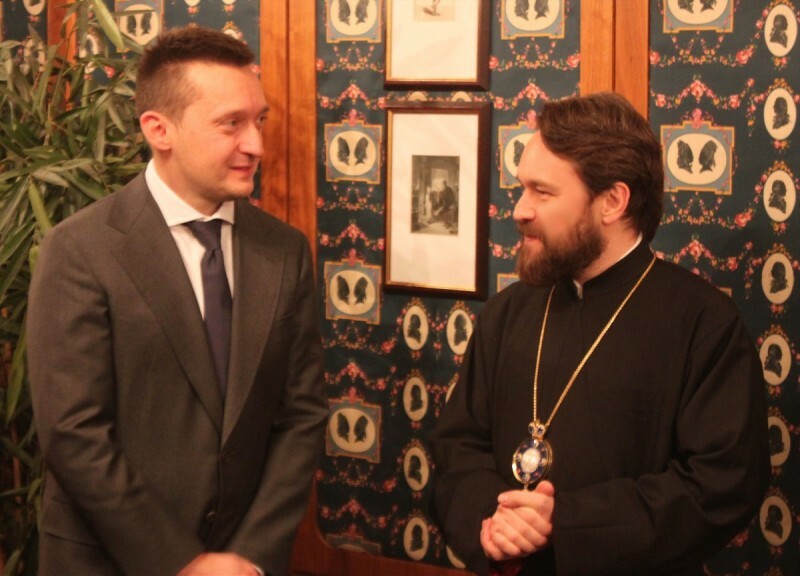 On 14th December 2013, Metropolitan Hilarion of Volokolamsk, chairman of the Moscow Patriarchate’s Department for External Church Relations (DECR), arrived in Budapest at the invitation of the Deputy Prime Minister of Hungary, Zsolt Semjén, and with the blessing of His Holiness Patriarch Kirill of Moscow and All Russia. Meeting Metropolitan Hilarion were Zoltan Challokeze, head of Mr. Semjén’s cabinet, Ms Martha Linke from the Ministry of Foreign Affairs, and Mr. Valery Platonov, cultural attaché of the Russian embassy in Budapest. That same day, the DECR chairman had a working meeting with Mr. Antal Rogán, Mayor of the 5th District of Budapest and parliamentary leader of FIDESZ- Hungarian Civic Union, the leading political party. During substantive talk they discussed topical international problems, focusing on the situation around Syria, various issues of the Russian-Hungarian cooperation, and moral climate in Europe. Mayor Rogán expressed his willingness to render financial assistance to the final phase of restoration of the spire of the Cathedral of the Dormition of the Mother of God of the Russian Orthodox Church’s Diocese of Budapest and Hungary. The Cathedral is located in the 5th District. The DECR chairman is accompanied by his assistant, deacon Alexander Karzan; Mr. Leonid Sevastianov, executive director of the St. Gregory the Theologian Charity Foundation; and Miguel Palacio, a staff member of the DECR secretariat for far abroad countries. Metropolitan Hilarion’s visit will last till December 16 and include meetings with Viktor Orbán, Prime Minister of Hungary; his deputy Zsolt Semjén; László Kövér, chairman of the Hungarian Parliament; and Cardinal Péter Erdö, Archbishop of Esztergom-Budapest.